Two years before the most momentous day in recent history there was a rare total eclipse of the sun, seen over parts of Europe and the USA. In the UK, where I live, the total eclipse corona was first visible in Cornwall on the 11th of August 1999 at 11:11AM BST. In other times solar eclipses were thought to be harbingers of destruction, but nowadays we see no meaning at all in the passing of the moon in front of the sun. Perhaps the ancients were wiser than are we. The internet is awash with conspiracy theories about the identities and motives of the real perpetrators of 9/11. While I agree that the official story of what happened on that day may be far from the truth and that there may well have been a government or secret service conspiracy of some kind, I would assert that the identities of the earthly perpetrators are ultimately of no consequence. They played their parts in the 9/11 drama, but the director was offstage and well beyond any human manipulation. On the morning of 11 September, 2001, I woke up to hear an inner voice speak the words "Serpent power”. I had an idea of what they might mean, so I wrote the words down and went off to work. I was later to discover that these words had deep meaning within both Judaism and Christianity, but at the time I only knew that the phrase "Serpent power" is used by Hindus, who also call it Kundalini energy. According to Hindu mythology, Kundalini is the serpent goddess, who is supposed to lie coiled at the base of the spine. This energy gives us strength and creative power. According to practitioners of yoga, under certain conditions this energy can rise up through the ‘chakras’ and give rise to a ‘Kundalini awakening’, a dramatic and potentially dangerous moment of enlightenment. I left work early in the afternoon and drove home, unaware of the apocalyptic events unfolding across the atlantic ocean. Around 3.00PM my wife phoned me to say that something extraordinary had happened and that I should turn on the television, which I did. Then I sat in front of it for eight hours, watching with horror, fascination and an odd sense of unreality as the serpent struck the USA, causing the deaths of three thousand people, the destruction of the twin symbols of global capitalism and the ‘Kundalini awakening’ of our sleeping world. As I absorbed all the news reports and interviews, my sense of the unreality of it all was compounded by something else. I couldn’t help but notice a growing string of numerical coincidences involving the number 11. For instance, the date was the 11th, the twin towers resembled the number 11, the first airplane to strike was flight 11 and there were 110 storeys in each building. In the weeks, months and years that followed, I came across many more of them. 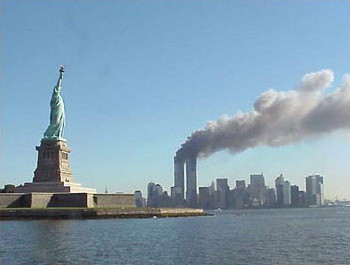 These elevens were strongly clustered around 9/11 itself, but, as you will see, the shockwaves from this event apparently extended into our future and far into our collective past. Some links between 9/11 and the number 11 are listed here. Could all these elevens be accounted for simply by chance? Certainly some of them could. Furthermore, the date of the attack, the target and other elements could have been deliberate decisions on the part of, or opportunities taken by, the perpetrators to assign it a significance. But others, such as historical events relating to the date, were more difficult to explain away. I sensed from the start that a more likely explanation for the unusual frequency with which the number eleven appeared in the facts and figures surrounding 9/11 was a phenomenon described by the great psychologist Carl Jung: synchronicity, or meaningful coincidence. It shone out like a beacon, signalling for those of us with ‘ears to hear’ that 9/11 was imbued with truly extraordinary significance. There is a 1-in-11 chance of any number being a multiple of eleven, therefore it is easy to produce a long and spurious list of eleven-related facts relating to any event. However, some facts mean more than others. The flight number of an airplane is far more significant to most people than other numbers associated with it. So everybody reporting on or discussing 9/11 thereafter referred to that airplane as “Flight 11”. The first number or name on any list is significant just for being first and is the one most easily remembered. So Flight 11 was remembered more than the other flights (although the other flight numbers are also important to the code). What I began to notice as I watched the news reports that day was that many of the most significant 9/11 facts in some way involved the number eleven. I was introduced to gematria in the summer of 2001, through an unusual series of events that were part of a larger awakening I seemed to be undergoing. Initially, I worked only with the ordinal value system, and it eventually occurred to me to calculate the ordinal values of some of the names and places most associated with 9/11. To my astonishment, the number 11 appeared to be a significant factor in many of them and I quickly realised that I had discovered another facet of the ‘eleven’ phenomenon. Some gematria linking 9/11 to 11 is listed here. I later discovered that in Hebrew gematria the word Reshith (the beginning) has the following values under the three main systems of numeration in Hebrew gematria. The standard value (called the absolute value in Hebrew gematria) is the most significant of the three, and the principle that words and phrases with equal numerical values are 'explanatory of each other', suggested then that 9/11 was some kind of beginning. The reduced value was 11, which as I noted above is the reduced value of Jesus. but what about the ordinal value of 74? This is also the ordinal value of Jesus. There are many, many more links between 9/11 and 11, recorded on several websites (for instance, see september11news.com). These show beyond any reasonable doubt that the drama that was played out 11 September, 2001, including the actors and the stage itself, was the focal point for a huge clustering of elevens. Perhaps even more impressive, however, is the growing evidence that the synchronicities surrounding 9/11 extend well beyond the confines of the event itself. But before we look at this evidence, I would like to show how another number, five, is encoded into one of the three 9/11 targets: the Pentagon. The clustering of elevens around 9/11 is well known and documented. What is less well known is the subsidiary role of the number 5, with which the Pentagon building in Washington DC appears to be earmarked. Some of the links between 9/11 and the number five are listed here. The ‘fiveness’ built into the Pentagon’s structural features could have been a deliberate planning decision, of course. But there is no explanation for why the name 'The Pentagon' and the word 'Pentagon' should be linked through gematria to the number five and its basic geometric expression. This mirroring of meaning and mathematics has apparently been built into the English language, hinting that more mysterious forces have been at work, spinning a web of meaning for us to trace out. Just how wide this web extends is sketched out in the rest of this page. Several books and films that were released in or around 2001 show signs of having been mysteriously influenced by 9/11, even though they were all created or at least begun, well before that day. Most of these blockbusting films had one overarching theme: a titanic battle between opposing forces, one identified with good, the other evil. Some of the references to 9/11 in popular culture are found here. Could it be that, at some deep unconscious level, we have sensed that 9/11 was going to happen? Could 9/11 have sent psychic shock waves backwards (and perhaps forwards) in time, to be picked up and unconsciously expressed by our writers and artists, influenced in a manner similar to Richard Dreyfuss’ character? If so, what does this say about the importance of 9/11? How far does the influence of 9/11 extend? If 9/11 has influenced popular culture to this extraordinary degree, what about human affairs in general? What about the natural world? How far back (and forward) does this influence extend? Since I began this work I have come across many examples of events, recent and historical, man-made and natural, that bear the mark of 9/11. Some of the foreshadowings of 9/11 in history are listed here. So human culture, significant events in history and even in the movements of the spheres all appear to be encoded with information forewarning us of 9/11. Again they also appear to be carrying on into the future, suggesting that any such effect operates, or is controlled, at level where past, present and future are one. How far back have the ‘shockwaves’ travelled? Pope John Paul II was the 110th pope from the prophecies of St. Malachy, who lived in the 13th Century, from which we might infer that they have travelled back a long way indeed. Is there any more evidence that synchronicity has a long reach? Let’s look at an ancient document full of dates, numbers, prophecies and detailed historical information: the Bible. In the Bible, numbers are repeatedly associated with the same ideas, and in this way have been used to enrich the meaning of many biblical narratives. The study of numbers in the Bible is often called biblical numerics, from which I discovered that the number 11 stands for disorganisation, disorder, imperfection and disintegration - all ideas that resonate with 9/11. I wrote above that Jesus is linked with the number 11 through gematria, which may seem inconsistent with it's biblical meaning. But Jesus was " ... numbered with the transgresors" (Luke 22:37). The other half of 9/11 is the number nine, which in biblical numerics is associated with judgment, endings, finality, fruits and suffering. This would imply that 9/11 was God's judgment on an imperfect, disordered system; it's ending; it's just deserts. These associations of number with concept are drawn from the text of the Bible, a document that was becoming of increasing interest to me as I began my Christian journey. This journey had begun three-and-a-half years previously and was accompanied by visions, prophetic dreams and other unusual phenomena, including the most astounding synchronicities (which made me very aware of the message-bearing potential of synchronicity). By November 2001 I was being assailed by these divine messages, which included three signs that my 9/11 investigations were to include a close study of the NIV Bible (1984 version). I have done so ever since, discovering along the way that within its pages are a treasure trove of references to a future event that would rock the world, sometimes presented as prophecies, but often hidden within biblical narratives. Some of the more obvious biblical references to 9/11 are listed here. I also began to notice that these stories were usually marked with the number 11, its multiples or related numbers. Incredibly, the numbers were often derived from bible features such as chapter and verse indicators or place values, the creation of which were widely separated in time and place from the writing of the passages themselves. These indicated that the Bible had apparently undergone some kind of teleological (goal directed) evolutionary process - no doubt by means of an exquisitely sophisticated weave of synchronicities - culminating in the 1984 version of the NIV Bible. From this initial survey we can see that 9/11, far from being a tragic but essentially meaningless occurrence, may in fact be the most meaningful historical event of modern times. The power of synchronicity appears to have produced a vast focal point in space and time, identified by the numerous signs and pointers in the events of that day in modern and ancient cultural artifacts, in historical events and beyond. In particular, 9/11 seems to have influenced, and been influenced by, the contents of the Christian Bible. The frequency of these signs appears to have increased exponentially as 9/11 approached. Accordingly, the ultimate meaning of 9/11 is to be found in a version of the Bible completed only in 1984, the NIV Bible, which was imprinted with the New Bible Code, and which it was my given ‘assignment’ to uncover. The NIV Bible has been encoded in myriad ways, principally by the positioning and wording of certain narratives, prophecies and imagery so that they coincide with multiples of eleven and other 9/11-related numbers found in the text and in their numerical values. This creates clusters of meaning that time and again can be seen to be referring to 9/11, proclaiming that this millennial event had a significance that transcended mere history to embrace biblical end-time prophecy. 1. The NIV also included a key which showed me how to unlock the code.